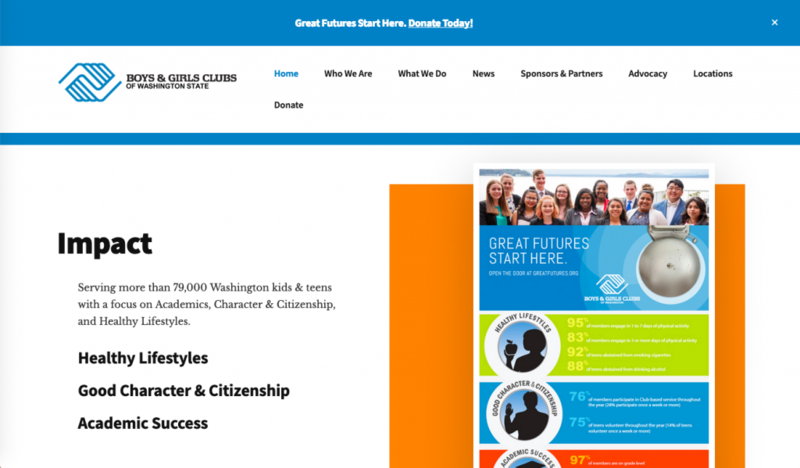 The Executive Director of the Boys & Girls Clubs of Washington wanted to update their website. She wanted a fresh look and improved functionality and she wanted the sponsor logos prominently displayed on the home page. Sponsor investments significantly impact the state association and she wanted to be able to show them in an impactful way. With the aggressive schedule, a bespoke website solution was not going to meet the aggressive schedule of 4 weeks so I used a Genesis child theme as a starter and modified it heavily to meet the design goals. The design of the annual report uses large boxes of solid color to separate sections of the report. I used these colors and created a home page that closely matches the annual report creating consistency across all of the communication media. The color scheme is bright, vibrant, and fun to work with. A large section was set aside on the home page for the display of sponsor logos. The logos are also on a separate page for sponsors. Prominent on sidebars and headers was a Donate button and link. 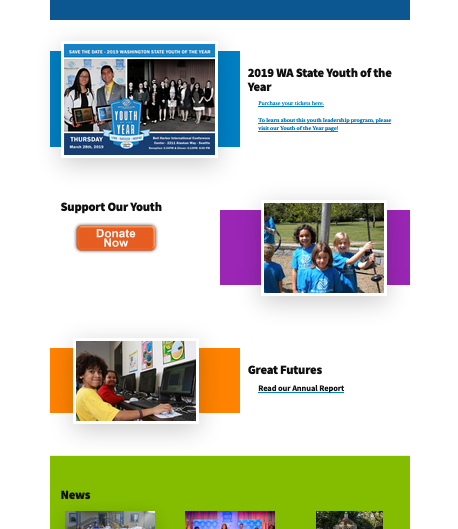 This is to help entice donors and sponsors so the association can continue to do its work or helping the youth of Washington. There is a password protected page where they can share documents with member organizations. There is also a page with a location search for local clubs. Even with the short schedule, the website update was completed in time for their annual event. Working with the association was enjoyable and it was a real pleasure getting to know their Executive Director and helping them continue their work.